Pneumonia can be a mild, severe, or even deadly infection that often follows a bout with a cold or flu, making it important to know the signs and symptoms. 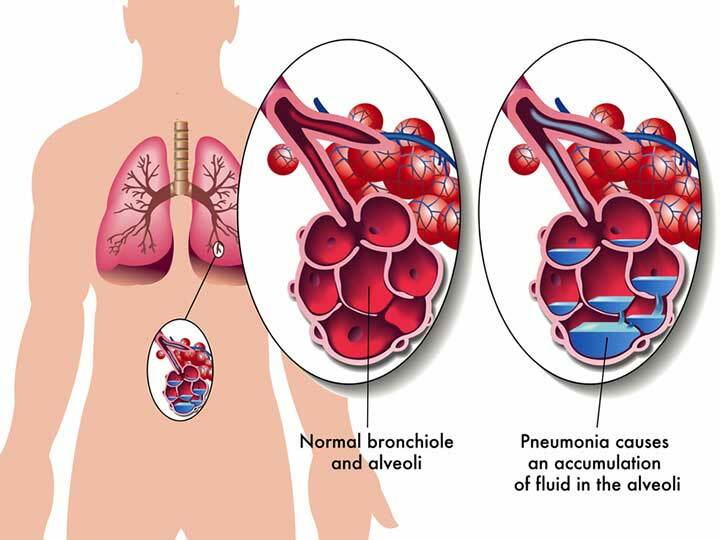 When the germs that cause pneumonia reach your lungs, the alveoli (or air sacs) become inflamed and filled with fluid, which can prevent oxygen from reaching the blood. With a brutal cold and flu season fresh in our minds, there’s increased attention and awareness on preventing and treating pneumonia, which can affect both children and adults with immune systems already weakened by viral infection. People with chronic health conditions or those who have undergone recent surgeries or lengthy hospital stays are also at risk. Pneumonia is a common lung infection that most healthy people can recover from on their own in week or two, but for young children, seniors, and those with pre-existing health conditions, it has the potential to be life-threatening. In fact, 50,000 people in the U.S. die each year from pneumonia, according to the Centers for Disease Control and Prevention (CDC). That’s why it’s important to know the risk factors and symptoms of pneumonia, as well as how to protect yourself and your loved ones. 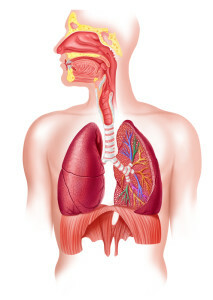 Pneumonia can be caused by a bacterial, viral, fungal, or mycoplasma infection. Most people contract it by coming in close contact with someone who’s already infected, but it’s also common to contract it during or following a stay at a hospital or other health care facility. People who use ventilators to support their breathing can also be at risk of infection. When the germs that cause pneumonia reach your lungs, the alveoli (or air sacs) become inflamed and filled with fluid, which can prevent oxygen from reaching the blood. The infection may affect only one part of your lung or it can spread to both lungs. If the infection spreads throughout the body, it can cause sepsis, which is life-threatening. Bacterial: The most common type of bacterial infection that causes pneumonia is pneumococcal disease (Streptococcus pneumoniae), but others include Legionella pneumophila, which causes Legionnaire’s disease, and chlamydia pneumoniae, which is more common in people between the ages and 65 and 79. Viral: The influenza virus can often lead to pneumonia in both children and adults, but the most common cause of pneumonia in infants under the age of 1 is respiratory syncytial virus (RSV). The common cold, human parpainfluenza (HPIV), and human metapneumovirus (HMPV) are also viruses known to cause pneumonia. Fungal: A fungal disease called Coccidioidomycosis—also known as “cocci” or “valley fever”—is a major cause of pneumonia, particularly in the southwestern U.S., according to the CDC. Valley fever doesn’t spread from person to person, but is breathed in from air containing microscopic fungal spores. Histoplasmosis and Cryptococcus are also known to cause fungal pneumonia. Mycoplasma: Known as an “atypical” bacterium, Mycoplasma pneumoniae can sometimes cause “walking pneumonia” (see sidebar). According to the CDC, between one and 10 out of every 50 cases of pneumonia contracted outside of a healthcare facility is caused by Mycoplasma pneumoniae. “Walking pneumonia” is the non-medical term for a mild case of pneumonia often caused by mycoplasma pneumoniae. Even though this form of the infection is mild enough to allow you to keep “walking” around instead being bedridden, it can still cause fever, chest pain, cough, and headache. And even if you’re well enough to perform your daily activities with “walking pneumonia,” it’s still important to see your doctor for treatment to prevent the infection from getting worse. If you’re in good health, according to the American Lung Association, you should start feeling better after treatment in as quickly as three days, but those with existing medical conditions may have a lingering cough that could last a few weeks or even months. Once your doctor confirms that you’ve contracted pneumonia, you may be treated with antibiotic or anti-fungal medications, as well as breathing treatments. Some doctors prescribe anti-viral medications for viral pneumonia, but it’s not common. You’ll also be advised to rest, drink plenty of fluids, and control fever with acetaminophen, aspirin, or NSAIDs. If you’re considered to be at a high risk of contracting a more severe form of pneumonia, your doctor will mostly likely choose to administer treatment at a hospital. But if you’re at home and notice your symptoms getting worse, even after taking your medications as prescribed, contact your doctor immediately. The pneumococcal conjugate vaccine, also known as PCV13 or Prevar 13, is recommended for children under 2, adults 65 and older, and those between 2 and 64 if they have certain medical conditions, include sickle cell disease and HIV. The pneumococcal polysaccharide vaccine, also known as PPSV23 or Pneumovax23, is given to all adults 65 and older, those between 2 and 64 if they have certain medical conditions, and adults between 19 and 63 who smoke. The CDC recommends getting the pneumococcal vaccine first followed by the pneumococcal polysaccharide vaccine at least one year later. Like the flu shot, pneumonia vaccines aren’t 100 percent effective, but they can reduce the severity of the infection if contracted. But unlike the yearly flu shot, the CDC recommends getting each pneumonia vaccine only once. If you have a severe allergy or you’re not feeling well, speak to your doctor first before receiving either vaccine. It’s also important to keep you and your children’s vaccinations up to date. The Hib, flu, measles, pertussis (whooping cough), and chicken pox vaccines can all help prevent infections that often lead to pneumonia. alcohol, allergy, anemia, antibiotics, asthma, bacterial infection, bronchitis, bronchoscopy, chest pain, children, cold and flu, common cold, copd, copd asthma, diabetes, diet, exercise, flu, Flu shot, fungal pneumonia, germs, good health, health, healthy diet, heart failure, infection, medical conditions, mycoplasma pneumoniae, nsaids, pain, pneumonia, senior citizens, shortness of breath, sleep, smoking, stroke, viral infection, viral pneumonia, virus, wheezing, your lungs.